If you spend any time in the kitchen, you are likely familiar with garlic - if not with the taste, then at least with its pungent smell. Love it or hate it, there’s no denying that garlic is not only a flavorful addition to meals, but also a powerful natural remedy as well. 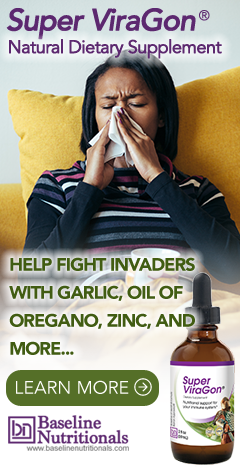 In fact, garlic is one of the best infection fighters available for both bacterial and viral infections. It is a natural antibiotic that does not appear to create resistant bacteria strains. In addition, fresh garlic extract has been shown to be capable of neutralizing or destroying many viruses. For instance, if you find yourself getting colds frequently, garlic may be of help. One study found that those who supplemented daily with garlic reduced the number of colds they had by 63%, and the average length of cold symptoms was reduced by 70% from those in the placebo group. Another study found that high doses of garlic extract may reduce the length of days you’re sick with a cold or the flu by 61%. This is one of the reasons you’ll find garlic as an ingredient in Jon Barron’s Super ViraGon formula. In addition, garlic possesses the ability to stimulate a healthy immune system. It can stimulate the activity of the macrophages (white blood cells), which engulf foreign organisms, such as viruses, bacteria, and yeast. Furthermore, garlic increases the activity of the T-helper cells (immune cells which are central to the activity of the entire immune system). In addition, when garlic is crushed or chopped, it forms a number of biochemicals that together with the odor-providing chemical ajoene, work to destroy many types of parasites. This is especially important during any detox and is why you will see garlic in Jon Barron’s Liver Tincture for detoxing and repairing the liver. "Garlic is the only antibiotic that can actually kill infecting [anthrax] bacteria and at the same time protect the body from the poisons that are causing the infection. It is known that the most sensitive bacterium to garlic is the deadly Bacillus anthracis, which produces the poison anthrax. Even the forefather of antibiotic medicine Louis Pasteur acknowledged garlic to be as effective as penicillin, and late studies showed similar activity to a more modern antibiotic, chloramphenicol. Even the blood of garlic eaters can kill bacteria; and it is also reported that the vapor from freshly cut garlic can kill bacteria at a distance of 8 inches!!" More than just an infection fighter, garlic has a number of other health benefits. Some studies have shown that supplementation with garlic may have a significant impact on reducing blood pressure in people with high blood pressure issues. In fact, one study showed that aged garlic extract at doses of 600-1,500 mg was just as effective as the drug Atenolol at reducing blood pressure over a 24 week period. It also appears to help reduce total and/or LDL cholesterol by about 10-15%. That’s just scraping the surface to all this bulb can do. It is credited with being one of the earliest “performance enhancing” substances. Ancient cultures used garlic to help reduce fatigue and enhance the work capacity of laborers, including the builders of the great pyramids. (Inscriptions found in laborers’ tombs at the great pyramids show that they loved their garlic.) It was even given to Olympic athletes in ancient Greece. Who knew such a tiny pungent tasting and smelling bulb could be capable of doing so much? So how do you capitalize on nature's natural medicine? Letting garlic sit for about ten minutes or so after you've chopped or crushed it allows the enzymes in garlic to start working on your behalf. If you use the garlic immediately, you run the risk of not getting its full benefits. For example, in the absence of chopping or crushing, research has shown that just 60 seconds of immediate microwaving will cause garlic to lose some of its cancer-protective properties. Immediate boiling of whole, intact garlic will also lower these properties, as will immediate addition of a very low-acid ingredient like lemon juice. So when you're thinking about dinner options tonight, don't forget to include the garlic! I like the helpful information you provide in your articles. Thank you for helping me with my health! I take it that garlic is only best eaten raw. How can a person eat it raw and it not be overpowering to those around her. Does parsley Really help? My husband says ,no. and he doesn't like it put in any foods I cook or to eat it raw. Any suggestions? 1. Take 1 clove crushed garlic at bedtime. I mix it with vegetable juice. 2. Persuade your spouse to do the same. Well written. I thought i already knew all aboout garlic, but i learned more today! I have used garlic and like it. I did not know what it really does to my body. I just knew it was good for heart patients. Then hair and skin. Now I see it is almost an all round food!! one stick butter softened to room temp. My Mom had heart Conditions she was taking 11 pills per day I crush garlic & add it to everything that I cook for her now the Heart Specialist reduced her pills to 2 per day! Garlic is the answer and now that my Son has bad cholesterol & high blood pressure I'm doing the same thing for him big improvement already! Garlic, Garlic, Garlic all the way!!!! you have nothing to lose than regain your health ! My wife and I take our Garlic in powder capsules. It is called Allicin Max, and this is 100% stabilised Allicin. There is no bad smell, and it WILL help you with many ailments. Start taking them today and you will very soon feel great. And do you know you can rub a clove of raw garlic (peeled and cut so it is juicy) on your feet and go to bed! In the morning do not be surprised to have garlic breath! It will penetrate your entire body -- even helping your lungs. It is a wonderful thing to keep on hand for whatever comes! The habit of slicing the Garlic bulb into strips and allowing to sit for 5 to 10 minutes before adding to any meal appears to also curb any body odour. I use the Garlic raw, no heating of any kind. The chemical reaction that takes place through oxidation with the air appears to negate this odour effect on the body. I take 2 or 3 cloves daily for blood pressure and am also hoping it will aid my Poly Cystic Kidney affliction. I simply can't imagine it. For those who don't like the smell or are afraid that others will object to your smell if you use it, try chopping a small amount of fresh peeled garlic, say half an average sized single clove, into small pill or capsule like sizes, and swallowing them with water or other beverage without chewing. You'll have the benefits in your gut and no smell or taste.